Wayne Health Care Marketing Director Terri Flood is pictured as part of Wayne Health Care’s sponsorship of Gathering at Garst. GREENVILLE – Wayne Health Care is a long-time supporter of the Gathering at Garst, and its prescription for a happy life would be a healthy dose of entertainment at the Gathering to lift guests’ spirits and start their toes tapping. 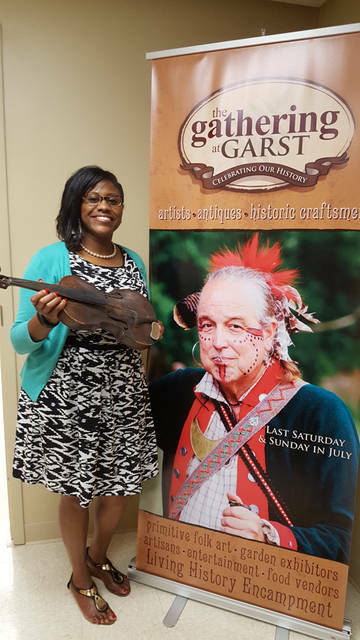 The Gathering at Garst is an annual event hosted on the grounds of Garst Museum the last Saturday and Sunday in July. It attracts visitors who come to engage in history; stroll among a venue of artists, antiques and craftsmen; sample food and enjoy the performers.